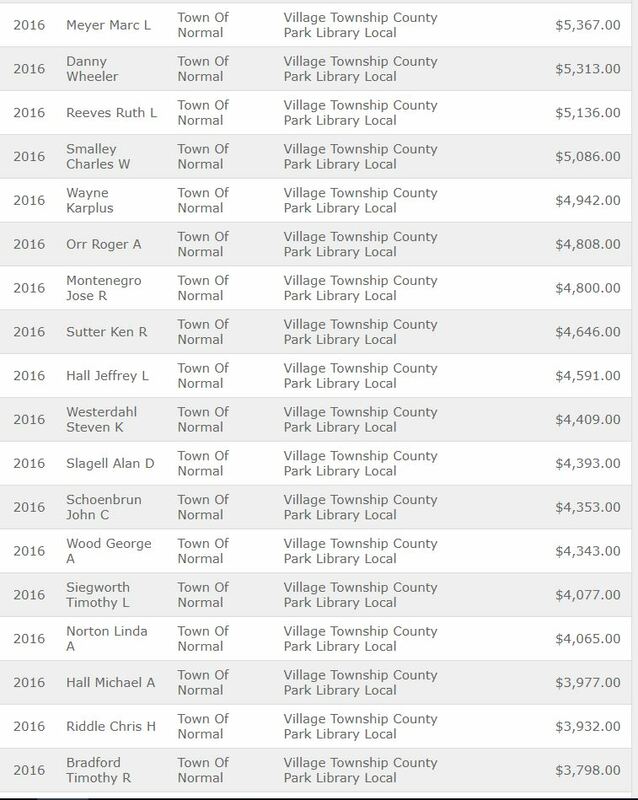 The Town of Normal has to cover all these pensions every month. How much money would you have to pay into retirement to get these monthly benefits? Posted in BloNo, Koos, Local, Normal, pensions, Progressives, Taxes. Since the Town of Normal loves taxes so much, I propose a “municipal pension income tax”. We’ll begin by heavily taxing the top 10% of pensioners. Haha! I suspect if this were mentioned, the Council would (at least for the moment) become a bunch of fiscal conservatives. Isn’t retirement pay state income tax free in Illinois? No one in the private sector has a tax exemption on withdrawals from tax deferred IRA’s. If there was no income tax paid on the pension contributions while employed, the retirement payouts should be taxed. Only in Illinois…. I believe so. Funny, isn’t it? That’s the one tax/fee that is never, never, ever floated. Hmmm…I think these pensioners should “pay their fair share” since they insist the rest of us do. Why is this news? Do they pay into Social Security? Didn’t they pay into the system? What am I missing? Yes and yes, but not NEARLY enough to get returns like this – that go up 3% every year. WHY 10%, heck, let’s tax them 20% It”s STILL cheaper then a ONE year capitol gains on stocks or farm ground! Maybe tax bicycles the SAME $101 a year as the state does for a license! How about THAT mr Koos? Holy cow!!! What the hell did these people do for the town of Normal? Are they brain surgeons? Now we know how we guarantee our retirement, work for the City of Ab-Normal. 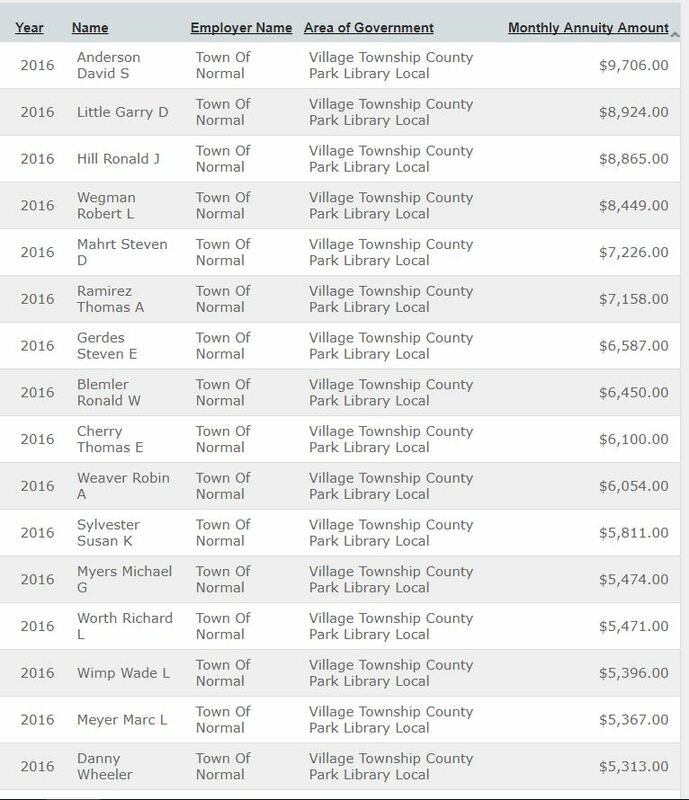 What were they getting in salary before they retired? Too much for a public responsibility, and I mean taxpayer supported. Isn’t this a little misleading? Unless I’m wrong, from what I have found, when an employee retires the municipality has no more finanical responsibility. The employee & employer pay into the IMRF during the term of employment, once one retires the IMRF has all the responsibility. Who pays if the markets crash? It isn’t the fund managers! The funds now are way under-funded because of very low interest rates that haven’t allowed the expected growth. It’s why cities are forced to make up the difference and why defined benefit plans need to be abolished. Simple really. Eliminate defined benefit and switch to defined contribution. Only argument I have with my liberal friends. Any business in the private sector with pensions is either bankrupt or struggling (GE). 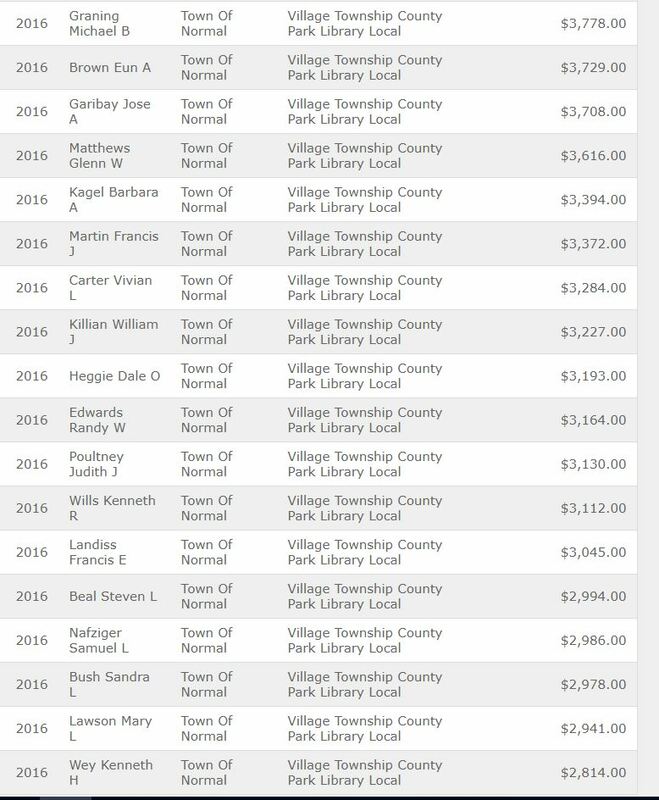 I like to look up their names on the tax rolls to see how many still live in McLean County after they retire. Many can be found down south!